Here are some simple rules to guide our newest drivers through these lots. Don’t travel faster than about 10 mph when in a parking lot. This will give you the reaction time you need to stop safely away from hazards. Stay on the right side of the lane between the spots, just like out on the road. It is simply where everyone expects you to be. If you have to use your horn, do two short blasts over one long one. It sounds less aggressive and gets the attention of other drivers just as well. You always yield to pedestrians, even if they are in the wrong! There are too many ways that someone can get hurt if a driver isn’t careful. Always expect people to do the wrong thing. Parking is without a doubt the biggest fear most new drivers have when they start on their path to getting their license. Except for professionals, like you find here at The Next Street, few people in the new driver’s life will have a detailed idea on how to park. Many parents will say to their teenage driver “Oh, I never do that,” or will have an ad-hoc method that never seems to work out the same way twice, leading to very frustrated students. 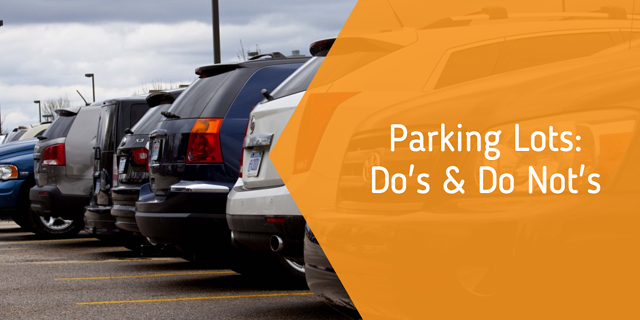 We have YouTube videos on how to do all of the parking maneuvers. Some quick tips to remember for safety are that you should never forget to use your blinkers, never park in more than one spot, and that parking next to other cars (even though it might be nerve-wracking) is actually easier than parking all alone! This is because it is much easier to figure out if you are off-line due to the large point of reference that other car provides. If parking next to other cars is something the new driver is having issues with overcoming, an easy fix is to set up a “dummy car” to park near by simply placing a large box, traffic cone, or similar object nearby where a real car’s closer taillight would be. This will be a larger point of reference for the student as they are backing in, just like a real car would be, without the anxiety caused by the possibility of hitting an actual car. Think you need some extra practice before getting your license? Take a private driving lesson with The Next Street and get the confidence and experience you need to pass the test!